The ageing adventurer was jet-lagged from his overnight flight from England, but no explorer could fail to be excited by the realization that there was another country at hand, so close! He perked up. He wasn’t alone. Singapore receives over 17 million tourists annually. 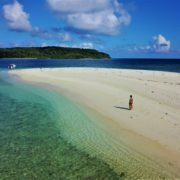 Yet few visitors realize just how near Indonesia is. In fact, Singapore is surrounded: by the tip of the Malay Peninsula to the north and by Indonesian islands in every other direction. At their closest point, Singapore and Batam are just 6 km apart. Work had taken me to Batam multiple times when we lived in Singapore. But I had never been there on vacation; in fact, the idea had never crossed my mind. 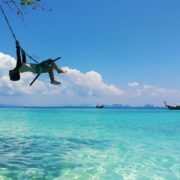 Of the nearby Indonesian islands, it was Bintan that was the ‘resort’ island. In contrast, Batam had a mixed reputation as a gritty, crowded ‘industrial’ island with a few nice golf courses. Could there be really be enough to keep our boys busy for four days? 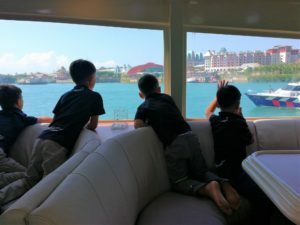 When I first informed them that we were going to Batam, they all started giggling. I didn’t get the joke. “Bottom?” Tai asked, grinning. Of course; I should have thought of that. But amongst Indonesia’s 17,000-plus islands, Batam was actually near the top. Offering very cheap labor within sight of ultra-expensive Singapore, Batam had developed a large manufacturing base and was already one of Indonesia’s most important islands economically. 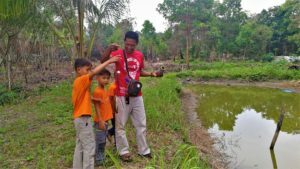 The availability of jobs had lured migrant workers from across the archipelago, swelling the population to 1.2 million. It’s easy to get to Batam from Singapore. There are nearly 80 daily ferry crossings between various locations on the islands. Travel times range from 45 minutes to 1.5 hours. 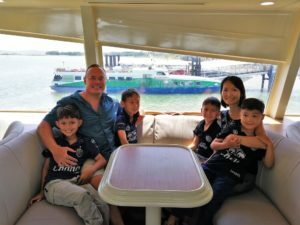 We traveled with Batamfast from Singapore’s HarbourFront Centre. 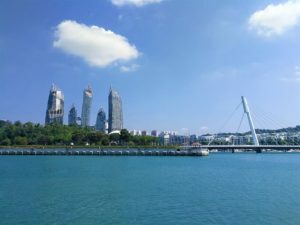 It’s a very convenient location for tourists: accessible by MRT, next to the big Vivocity shopping mall and directly opposite Universal Studios Singapore. 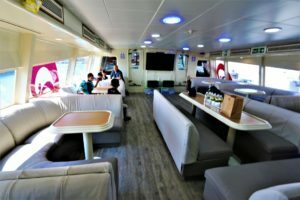 Onboard Batamfast’s sleek Ocean Raider boat we got a wonderful surprise: seats in the spacious VIP/Business Class section upstairs! “Wow! This is total luxury!” Logan shouted, sprawling out on the comfy white leather seats. 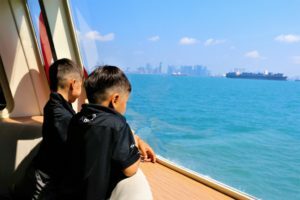 The boys’ eyes were glued to the windows as the boat cruised past Sentosa and out into the Singapore Straits. As always, the sea was busy with dozens of boats waiting to call at Singapore’s port. It’s quite an amazing sight. After crossing the Straits, we sailed east across the northern edge of Batam before turning into the deep inlet that led to the port. Despite a long line of golfers shouldering heavy bags, we cleared immigration quickly and were met in the arrivals lounge by Darno, our friendly driver for the next four days. 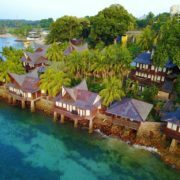 The Batam View Beach Resort is an older property in a brilliant location. 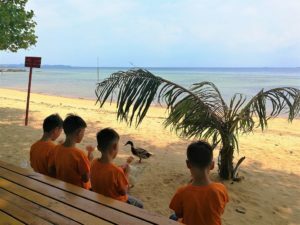 The rooms in the classic double-winged main building have been nicely renovated and the well-maintained grounds include a large pool, a soccer pitch that doubles as an ATV course, a fruit and herb garden and an effectively private beach with a full range of watersports. 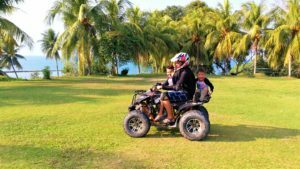 Logan and Tai loved riding on the mini-motorcycles. I took Drake and Kiva for ATV rides over little obstacles. And all five of us climbed to the top of the floating bouncy castle. 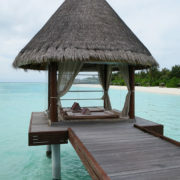 For the adults, the real attractions of the resort were its seaview and waterfront villas. 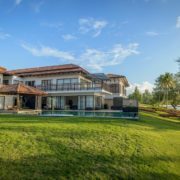 Built in a traditional style with wood shingled roofs and protruding gables, the villas have wonderful views of the Singapore Strait and the South China Sea. At night, I could see the lights of Singapore’s East Coast Park, where I had pushed the boys a thousand miles in a jogging stroller. And during the day, I could just make out the distinctive shape of the Marina Bay Sands, where I had stood with Sir Ranulph all those years ago. The Illusion Batam wasn’t large, but we spent two happy hours in the trompe l’oeil playground. The four young ladies working there were fantastic, helping us to stage the photos and look after the boys. 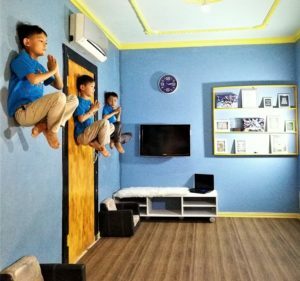 My favorite illusion was of the boys levitating: legs crossed, palms together, floating halfway up the wall. 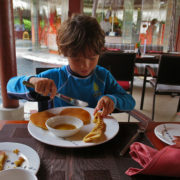 The image looks convincing, but I know better – what my boys achieve daily is the opposite of Nirvana. 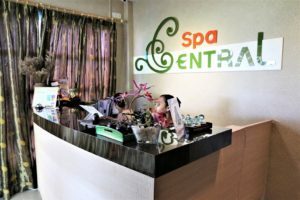 I did, however, enjoy (almost) an hour of real serenity at Spa Central, the best place for a proper massage in Batam. I actually prefer Indonesian-style massages to Thai-style deep stretching torture. My masseuse had the strength and skill to untie the knots in my back caused by four weeks of sleeping on rock-hard Thai hotel beds. 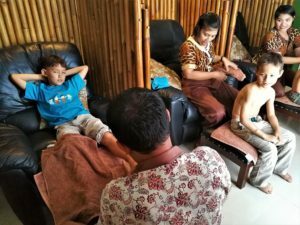 Nori was getting an aromatherapy massage nearby and the boys were getting foot massages and back/neck massages in a separate room. It was uncharacteristically, perfectly quiet. Just as I was beginning to drift off, I heard the thumps and shouts of a Brixen Boy fight. Sigh. Batam is busy on the weekends, with hotels and golf courses full of Singapore locals and expatriates. During the weekdays, the same resorts are generally empty. 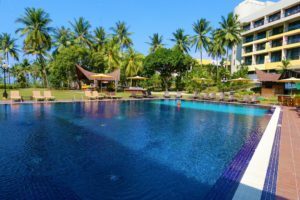 On Thursday, we had the pool to ourselves during the day and were one of a few occupied tables at the hotel’s Kelong Restaurant in the evening. But by Friday night, the lobby bar was heaving with tipsy colleagues on a company off-site. We had hoped to do a mangrove kayak tour at the new Seaforest Park, but the weather wasn’t cooperating. 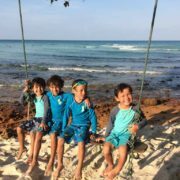 So while Nori and the boys got a golf-buggy tour of the Nuvasa Bay development, I zipped back to the hotel to pick up the boys’ swimming clothes. 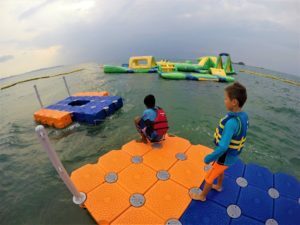 Despite the forboding, black clouds and choppy waves, the boys were begging to experience the Aqua Adventure Track, an inflatable obstacle course tethered off the point. I was a bit hesitant (I broke my nose at a similar water park in Thailand) but we all had a great time. We love to makan (‘eat’ in Bahasa Indonesia), so when I came across Batamliciouz’s Instagram feed, I knew we’d be alright. With over 77,000 followers, a bottomless gullet, high cholesterol and loads of charisma, Chandra is the guy who would have taken Anthony Bourdain around if he had ever made it to Batam. Unfortunately, we weren’t able to meet Chandra in person. But his recommendation for 3-in-1 carrot cake at Abun Cha Kue was spot-on. 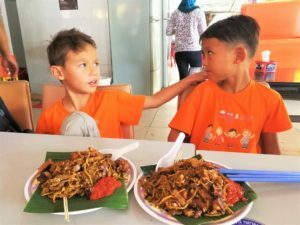 Even our finicky boys enjoyed the different textures of the two types of noodles (mie and kway teow) and the spongy radish cake all wok-fried together with a dark, semi-sweet sauce. 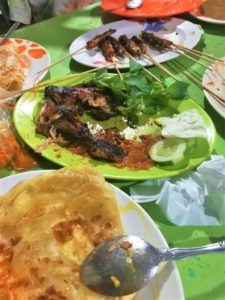 In Kampung Batu Besar (Big Rock Village), we stopped for dinner at a busy place serving chicken satay (sate ayam) and grilled chicken (ayam bakar). It took 30 minutes for them to charcoal-grill the boys’ 40 satay skewers and five minutes for the boys to devour them. At first they dipped and then they dunked the charred meat into a delicious, freshly-made peanut sauce. Our simple-sounding ayam bakar was an unexpected treat, an ample leg with perfect grill marks served with a spicy, smoky sambal sauce. Clearly, we had not given Indonesian food enough credit previously. Not far from Batu Besar, we turned down a road that passed first a Muslim and then a Chinese cemetery. 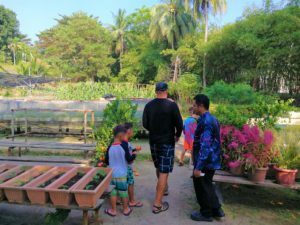 Just before the road descended to the coast, there was an entrance gate and a man selling tickets – 5,000 rupiah per visitor (about US$0.30) to Kampong Teri. I’d never seen this before: a fee collected by a village to help protect its authenticity. But I liked the concept. Down near the muddy shore, a cluster of stalls sold coffee, tea, coconut water, fried crabs and shrimp omelettes. Everybody wanted to know about the boys. Thankfully, my Indonesian is decent. 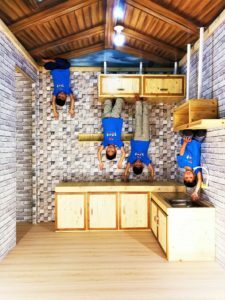 “Mereka dua kembar.” They are two sets of twin boys, I replied, to predictable shock and amazement. “Very good…very strong,” said grandmas in headscarves, smiling and clenching their hands into triumphant fists. Nori frowned. She had done most of the work, after all. 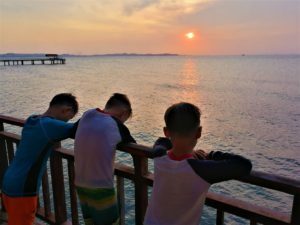 As we crowded onto the ferry to Tanjung Pinang, Bintan Island’s capital, I thought about our four days on Batam. What a pleasant surprise this ‘industrial’ island had been! We would have loved a few more days to explore the local food scene. 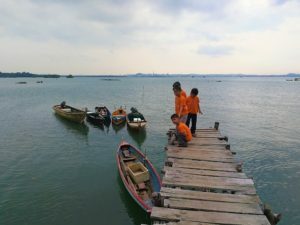 And we never got the chance to drive the Barelang Bridges, six spans that connect Batam to Rempang, Galang and other islands. Batam had ferry services to islands that I had never heard of (Lingga, Singkep) and an increasing number of domestic and international flights from Hang Nadim Airport. 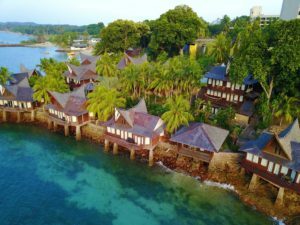 Batam was much more than just a weekend golf or spa escape from Singapore. 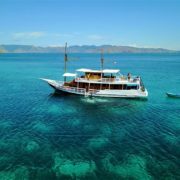 It was an authentic, chaotic, entertaining, delicious and even beautiful gateway to a little-explored region of Indonesia. Batam’s up! 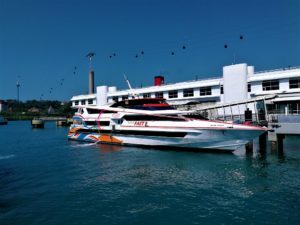 – Batam Fast Ferry (batamfast.com) 20+ ferries daily from Singapore to all of the International Ferry Terminals in Batam. We would not and could not be where we are today without the support of our guests. One of our core beliefs are that our client’s feedback means more than any amount of money ever could! There are no words that can express our sincere thanks to all who have supported us and who have taken the time to write about their experience/s.